In Newton’s First Law, an object in motion stays in motion until a force acts upon it. Under new leadership, the Federal Reserve’s monetary policy strategy appears to be following the same logic. In his June press conference, chairman Jay Powell said the Fed would raise interest rates until “we get a sense that the economy is reacting badly”. The latest numbers suggest the US economy is doing anything but reacting badly. The unemployment rate declined to 3.75 per cent, a 48-year low and three-quarters of a percentage point below the Fed’s median estimate of its long-run sustainable rate. Consumer prices rose 2.3 per cent in May from a year earlier. Excluding volatile food and energy categories, core personal consumption expenditures inflation moved up to 2 per cent, matching the Fed’s target for the first time in more than six years. 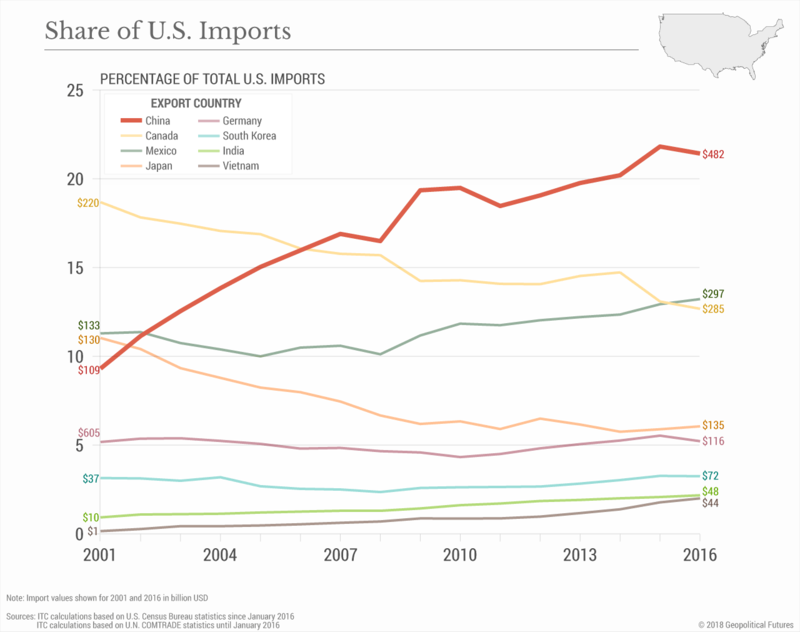 Despite downside risks from trade tension, these trends look set to continue. Monetary policy is still expansionary on top of the sizeable fiscal expansion that will build in the coming years. The labour market is poised to get tighter and put continued upward pressure on inflation. With its latest increase in the federal funds rate to a range of 1.75 per cent to 2 per cent, the Fed has finally brought real interest rates to approximately zero. With further gradual increases every quarter, interest rates would end the year at the lower end of Fed policymakers’ range of neutral — ie, the rate that neither stimulates nor slows economic activity. Given the gradual pace outlined in the Fed’s Summary of Economic Projections, monetary policy would eventually become modestly restrictive sometime in 2019 or later. Mission accomplished? Economic theory and history suggest otherwise. With long and variable lags between monetary policy and its effect on economic activity, theory teaches that interest rates need to be restrictive before the economy overheats. The likelihood is the Fed will enable an even hotter economy and then really have to cool it down. With markets discounting an even more gradual path of rate rises, the central bank risks a sharp financial snap back when it has to slam on the brakes. 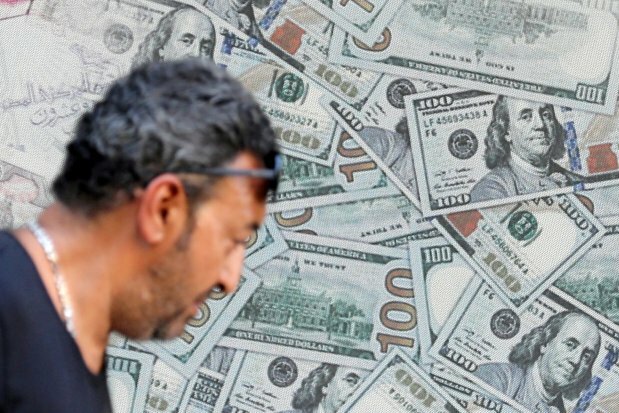 International financial markets are responding to the prospect of tighter US monetary policy by bidding up the value of the US dollar against other currencies. In the past, this has been a key catalyst for international financial crises. With the Fed raising rates and the People’s Bank of China cutting reserve requirements in June, the renminbi slid more than 3 per cent against the US dollar, its largest ever monthly drop for the tightly managed currency. Continued depreciation risks a replay of the destabilising capital outflows seen in 2015 when US and Chinese monetary policies also diverged. At that time, a mild financial panic that played out into early 2016 stoked fears of global recession. Elsewhere in emerging markets, central banks are under pressure to respond to a stronger US dollar by defending their currencies with rate rises. The most vulnerable economies like Argentina and Turkey already demonstrated acute strain with sharp depreciations in their currencies and capital outflows. It’s not just the most mismanaged economies that are vulnerable. Indonesia surprised the market by raising rates 50 basis points last month. 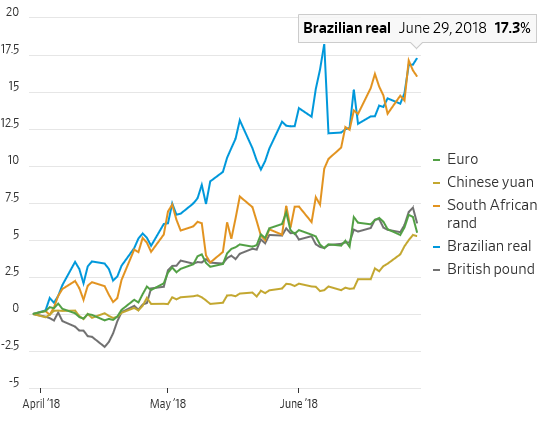 Mexico is raising rates to defend its currency and some observers think the next move in Brazil will have to be a hike as well. In these countries, equity markets are down on the year and the appreciation in the US currency is making it harder for domestic borrowers to pay back more expensive dollar-denominated debt. Back home, the Fed has largely shrugged off the international consequences of its actions. Gradualism seems to pose manageable risks because inflation only recently hit 2 per cent and probably will remain contained in the near-term given how flat the Phillips curve appears to be. Unfortunately, history teaches that the Fed has never successfully managed a soft landing with the current set of macroeconomic conditions. In every case when the Fed tightened policy by enough to raise the unemployment rate by more than four-tenths of a percentage point, it caused a recession. However, Powell said at his last press conference that it’s “very possible” the long-run sustainable unemployment rate is lower than 4.5 per cent. There is surely uncertainty about the unobservable variables that guide policy. But, if there’s uncertainty, why conduct policy as if the true value is 75 basis points or more below your official estimate? A high-pressure economy feels great during the party. But the recessionary hangover can be brutal. A better strategy would be more forward-looking. Recognise the economy is overheating rather than hoping that it’s not, announce that policy will need to be more restrictive sooner than expected, and get on with it. Policymakers would have to endure some pain in the short run as they realign market expectations to a more hawkish rate path. But that’s better than the gradualism that virtually guarantees a larger, more painful realignment later on. Has One Tweet Reversed Gold’s 3-Month Downtrend? 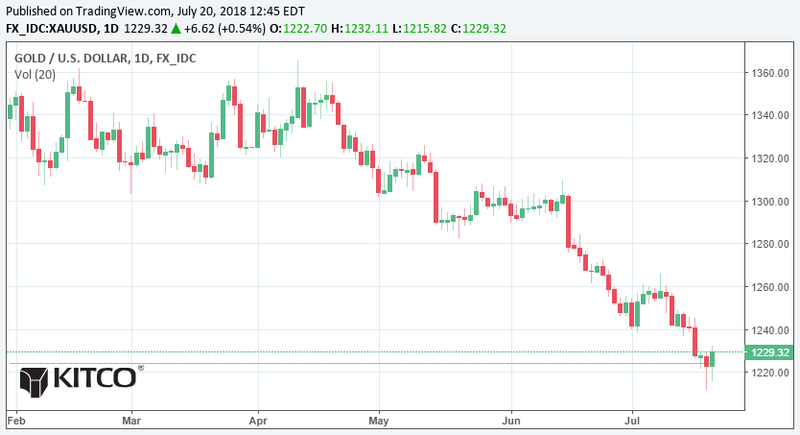 (Kitco News) - While one tweet has helped to reverse gold’s near-term fortunes, some analysts have said that more work needs to be done to end the yellow metal’s three-month downtrend. Although gold is ending is second week in negative territory, the market is well off its one-year lows as the U.S. dollar bulls reacted to comments from President Donald Trump. Gold’s bounce started Thursday afternoon after Trump said, in an interview with CNBC, that he was “not thrilled” with rising interest rates as they are hurting economic growth. August gold futures have managed to hold on to its gains heading into the weekend, last trading at $1,229.20 an ounce, down almost 1% from last week. The President doubled down on his comments Friday morning in a tweet questioning why the U.S. is raising interest rates as debt is growing and coming due. He also called out China and the European Union for manipulating their currencies, taking away the U.S.’s competitive edge. While gold is testing critical resistance just below $1,236 an ounce, some analysts are questioning whether these comments will reverse gold’s downtrend. Streible added technical momentum indicators are still bearish for gold and that the downward trend is still fairly strong. However, for investors who are interested in testing the gold waters at current levels, he likes the idea of buying October $1,250 calls. For gold, Hamilton said that while physical demand is expected to pick up with prices hovering near a one-year low, the market needs a weaker U.S. dollar to attract major asset managers. Neil Mellor, senior currency strategist at BNY Mellon, said that he doesn’t see the President’s tweets shifting the strong bullish U.S. dollar sentiment in the marketplace. “We already know that he doesn’t like a strong U.S. dollar. Nothing he said was new for the market,” he said. Mellor said that the price action he currently sees is more an indication of investors taking profits, rather than a reversal of futures. Mellor also said that he doesn’t think that Trump’s tweets will stop the U.S. central bank from raising interest rates. He also said that China has no choice but to continue to devalue its currency to support its economy. At the same time, Mellor added that European economic growth would support any hawkish comments from Mario Draghi, president of the European Central Bank, next week. “I think we are going to see some fresh euro selling and that will continue to support the U.S. dollar and hurt gold,” he said. But not everyone is negative on gold in the near term. Eugen Weinberg, head of commodity research at Commerzbank said that the market reaction to Trump’s central-bank comments is proof that investors should not completely ignore gold. While investors having been swept up in the euphoria of near-record equity valuations, Weinberg said that cracks are starting to show in the global economy and he expects safe-haven demand to grow in the coming months. 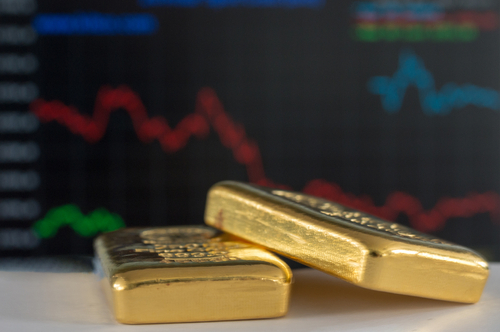 George Milling-Stanley, head of gold investments at State Street Global Advisors, said in a recent interview with Kitco News that he expects recession fears to eventually push gold prices higher through the rest of the year. 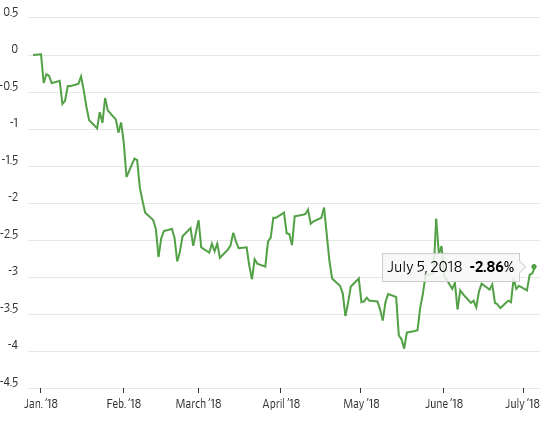 Although gold is seeing a healthy jump off its recent one-year low, Weinberg said that more work needs to be before the metal attracts more buying momentum. He said that gold needs to push above $1,250 an ounce before investors feel confident that the current downtrend has finished. Streible added that he is also watching $1,250 an ounce in the near term. Chris Beauchamp, market analyst at IG, said that gold prices have to push above $1,265 an ounce before the trend of lower highs is broken. The economic calendar next week is fairly sparse with little major data to be released. The markets will receive some important housing sales data and preliminary manufacturing data. The big economic reports come at the end of the week with the release of U.S. durable-goods numbers published Thursday and then the first reading of second quarter U.S. gross domestic product Friday. Economists are expecting that the U.S. economy grew 4% in the second quarter. In his testimony before Congress this week, Fed Chair Jerome Powell presented a fairly optimistic view on the U.S. economy. “The FOMC believes that--for now--the best way forward is to keep gradually raising the Federal funds rate,” he said. With little economic data on tap next week, commodity analysts will also keep an eye on more rhetoric on global trade. According to reports, Trump has said that he is “ready to go” to launch $500 million in tariffs on imported Chinese goods. “Increasing trade wars raises the risk of slower economic growth so we could see more movement into gold,” said Weinberg. 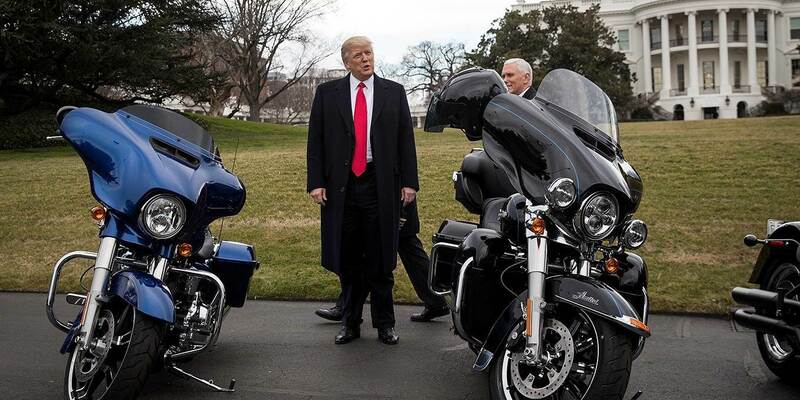 Then, in a later tweet, Trump falsely stated that, “Early this year Harley-Davidson said they would move much of their plant operations in Kansas City to Thailand,” and that “they were just using Tariffs/Trade War as an excuse.” In fact, when the company announced the closure of its plant in Kansas City, Missouri, it said that it would move those operations to York, Pennsylvania. At any rate, Trump’s point is nonsensical. If companies are acting in anticipation of his own announcement that he is launching a trade war, then his trade war is not just an excuse. Needless to say, none of this is normal. Trump’s statements are dripping with contempt for the rule of law. And none of them rises to the level of anything that could be called trade policy, let alone governance. It is as if we have returned to the days of Henry VIII, an impulsive, deranged monarch who was surrounded by a gaggle of plutocrats, lickspittles, and flatterers, all trying to advance their careers while keeping the ship of state afloat. And yet, neither Speaker of the House Paul Ryan nor Senate Majority Leader Mitch McConnell nor Pence has dared to do anything about Trump’s assault on American democracy. Republicans are paralyzed by the fear that if they turn on Trump, who is now supported by roughly 90% of their party’s base, they will all suffer at the polls in the midterm congressional election this November. Finally, one must not discount the fear factor. Countless Americans routinely fall victim to social- and cable-media advertising campaigns that play to their worst instincts. You can rest assured that in this election cycle, as in the past, elderly white voters will be fed a steady diet of bombast about the threat posed by immigrants, people of color, Muslims, and other Trump-voter bugaboos (that is, when they aren’t being sold fake diabetes cures and overpriced gold funds). Regardless of what happens this November, it is already clear that the American century ended on November 8, 2016. On that day, the United States ceased to be the world’s leading superpower – the flawed but ultimately well-meaning guarantor of peace, prosperity, and human rights around the world. America’s days of Kindlebergian hegemony are now behind it. The credibility that has been lost to the Trumpists – abetted by Russia and the US Electoral College – can never be regained.